Startseite » English articles » Be Seeing You! At an exhibition currently on show at the gallery Semmer Berlin (Germany), the Australian artist Jenny Brown is offering a re-interpretation of the cult television series The Prisoner. Sacha Kagan, who collaborated with Jenny on one of the works on show, further discusses here how the TV series critiques the illusions of ‘freedom’ as emancipation from attachments. Since March 17th 2013 (and until the end of April), the gallery Semmer Berlin is hosting Jenny Brown’s Many Happy Returns, a show revolving around the cult television series The Prisoner from the late 1960’s. The prisoner in that TV series is a British former secret agent (played by Patrick Mc Goohan), held in an isolated mysterious coastal village resort where his captors try to find out why he abruptly resigned from his job. The village is a surrealistically set-up environment, a jail without walls but replete with CCTVs and anti-evasion technologies. The village is also a factitious community where personal names are replaced by numbers (the prisoner is referred to only as “number 6”) and where social interactions are performed and manipulated in a variety of ways. In her show, Jenny Brown explores the theme of governmentality as highlighted in The Prisoner: “The Village acts as a microcosm for our various government territories with their own jurisdictions and means for maintaining authority and control.” The main piece in the exhibition, titled Many Happy Returns (after one of the episodes of the series), is constituted of 25 folkloric tourist plates depicting sites of the Global North and accompanied by short texts narrating the stories of specific “change” agents and situations affecting issues of governance in the respective countries. Reading these small texts, the exhibition visitor may start wondering about the wide contrasts between their protagonists (ranging from Margaret Thatcher to Elinor Ostrom), and the different consequences of the changes they brought about. 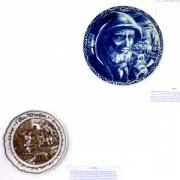 Upon a closer look, the viewer can then notice that the scenes and landscapes on the plates were modified, with the addition of an ominous white sphere. That sphere is no other than the “Rover”, a balloon-like device that behaves as if it were a self-aware or quasi-intelligent entity, recapturing those who attempt to escape. Replaced in the multiple space/time contexts depicted on the plates, and in relation to the accompanying texts, the Rover displaces its ominous threat from The Prisoner’s village (in the cold war context of the 1960’s) to a global and trans-historical village: “Rover was effective in contributing to gaining and maintaining the Villagers’ role in their own self-government allowing for the construction of auto-regulated or auto-correcting citizens. Foucault describes this process as “governmentality” which refers to a variety of historical periods and to different specific power regimes in relation to the calculated means of directing how we behave and act where power is de-centred and the knowledge produced means members play an active role” (Jenny Brown). 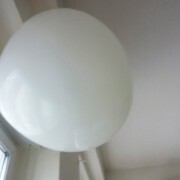 Rover is present in two further iterations in Jenny Brown’s exhibition: Once ‚in persona‘, as a large balloon hovering quietly over the exhibition space, and once again as part of a video piece: a slow-motion close-up of Rover suffocating a villager. The facial traits of the victim slowly appear/emerge and disappear/vanish into whiteness, as the balloon envelopes his face. The video is somehow reminiscent of some of the works by Krzysztof Wodiczko. 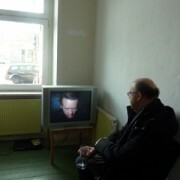 Besides, some episodes from the original TV series can be viewed by the visitors of the exhibition, on a cathodic television screen. The remaining work on show is a collaboration between Jenny and myself. Entitled Be Seeing You, it takes its name from the village’s specific verbal expression replacing “goodbye” or “farewell”. In the work’s background is a poster featuring portraits of people from around Berlin’s Mauerpark who are signaling the village’s gesture that accompanies the farewell “be seeing you”. Taking up the “why” question and considering the need for normative, engaged critical practice, that work consists in an attempt to apply some tools from systems thinking and ‘sustainability science’ to map the complex issues of the village situation, with the aim to assist the prisoner to escape. More specifically, Jenny and I started a process of so-called “problem mapping”, applied to the village, and invited exhibition visitors to further complete this exercise, suggesting some inspiration may be found in some of the 25 exhibited plates and stories of Many Happy Returns. In The Prisoner, number 6 is a prisoner of his own delusional conception of freedom, and of the spectacle of his individuality. To illustrate this, I need here to share some more details from the original TV series. However, again and again, number 6 fails to fully escape from the village. When he does escape, the hold of the village follows him, in the streets of London, in his own private home, and within the British secret services… It were as if the “freedom from” the village were ever unattainable for the numbered but unnamed hero. The “freedom from”, the emancipation, is then also the transfer to this supposedly emancipated individual, of the power, the “power over”. Freedom from is inseparable from power over. Both are ultimately delusional, and the number 6 who is no longer a number, but a free man, puts himself into the control tower of the objectifying subject, the modern man, number 1: the man who pushed on the ultimate button. (In the final episode, after chasing after his laughing self, The Prisoner pushes on a button and an atomic missile is being launched.) Fooling ourselves with “freedom from”, we turn into our own worst enemies. Activists and critical scholars have been raising for several decades, numerous issues related to different understandings of power and governance. Some of them invited us to relinquish “power over” and rather exercise “power with”, as did for example Roslyn Wallach Bologh in her book Love or Greatness: Max Weber and Masculine Thinking, A Feminist Inquiry (Unwin Hyman, 1990). “Power with” involves noncoercive relationships, respectful dialogues and mutual empowerment. It is rooted in relationships rather than rooted in individual self-interest. We can indeed re-interpret The Prisoner in the light of an article from Bruno Latour, entitled “Factures/fractures: de la notion de réseau à celle d’attachement” (in André Micoud et Michel Peroni, Ce qui nous relie, éditions de l’Aube, 2000). In his article Latour considers emancipation as an illusion, and invites us to re-attach ourselves, instead of fooling ourselves with the idea that we can simply achieve detachment (without re-attachments). Or in other words, we cannot experience “freedom from”, but we can engage in a practice that tends towards “freedom with”. For Latour, we can look into the qualities of our diverse “networks of attachments” and then consider which attachments are good or bad for us. We can then choose which attachments to privilege over others. “Freedom with” lies not in escaping from the village, but in transforming what happens both inside the village and in the relations between the village and the world system in which it is embedded. The aim is not to outsmart the Rover and get out (out to where? ), but to reconfigure the attachments and relationships in the glocal village. The Prisoner does try out some of this at several points throughout the TV series, with more or (most often) less success. However, the prisoner’s focus on escaping the village, and the constant influx and outflux of villagers and of number 2s, prevent that “freedom with” from developing itself in the village. The art worlds can, in some ways, remind us of The Prisoner’s village. For example, contemporary artists may germinate seeds of “freedom with”, but, “by hook or by crook”, are themselves often moved in and out as are the villagers in The Prisoner, and are affected by the influx and outflux of others (whether within the art worlds, in projects, or in specific local contexts). Also, some artists are still fooled by the delusion of “freedom from”, performing a spectacle of freedom and individuality, fitting their modern roles – as I discussed in the book Art and Sustainability (transcript, 2011, pp. 69-73). Others content themselves with superficial practices of relational aesthetics, not unlike some of these superficially entertaining activities enjoyed in the village but rejected by number 6. However, Jenny Brown belongs to another kind of artists, artistic researchers and artivists whose activities are reaching beyond the superficiality of relational aesthetics, glossy projects or naive individualism, and pointing at possible ways to foment “freedom with” in diverse communities of practice. Although her exhibition for Semmer Berlin does not directly involve local communities in such a way (operating rather as studio-based symbolic work), Jenny Brown’s re-interpretations of The Prisoner and the issues she addresses in her show Many Happy Returns, are doubly relevant, both for social activism towards sustainability and for a politically reflexive practice in art and artistic research. Der Beitrag wurde am Dienstag, den 16. April 2013 um 12:50 Uhr veröffentlicht und wurde unter English articles abgelegt. Sie können die Kommentare zu diesen Eintrag durch den RSS 2.0 Feed verfolgen. Sie können einen Kommentar schreiben, oder einen Trackback auf ihrer Seite einrichten.